Just had my first sighting of daffodils in bloom. What??!! Where are you? The Isles of Scilly? Here in west central Scotland, we've only got an inch or two showing above ground. In west Perthshire the daffodil tips are just showing above the recently frozen soil although I have had many pots of forced hyacinths blooming in my house since Christmas. kiloran wrote: What??!! Where are you? The Isles of Scilly? Cheltenham, they were on a road verge just outside town. plenty of daffs showing through in pembrokeshire , but nowhere near blooming yet . The early ones have been in bloom for a week or so along the roads between Bristol and Weymouth. And was there ever such a year for hellebores? Our garden is bursting with the beautiful things. (Mrs BJ is a bit of an enthusiast.) There are dozens of new varieties these days, and some of them are very showy. And they're all as tough as old boots. A beautiful harbinger of spring. Go on, treat yourselves. We have always said that say Cheltenham southwards is about a month ahead of us and so it would seem. I too have a lot of hellebores but they are currently doing nothing, like most of the rest of my garden except I see daffodil shoots coming up quite rapidly, but we now have another spell of cold weather so I do not expect them to do much for another week or two. Great photo BTW from redsturgeon, thanks. On a south facing slope, where a stables had effectively created a hot bed by dumping their muck, daffodils have been seen blooming north of the Antonine wall for well over a week. Back in our garden, the snowdrops are blooming, and the hellebores are just pushing their buds up. It always seems a pity that you need to get down on your hands and knees to see the full beauty of their flowers. Maybe I should try them in a hanging basket. I hate daffodils.... no idea why, some unpleasant associations? Still no daffodils with me but I have just noticed the first colour on some crocus. And another sign of spring. Last Friday there were two oyster catchers by a pond where I regularly walk. Yesterday there were nearly two dozen. All those SAD sufferers will be cheering up. 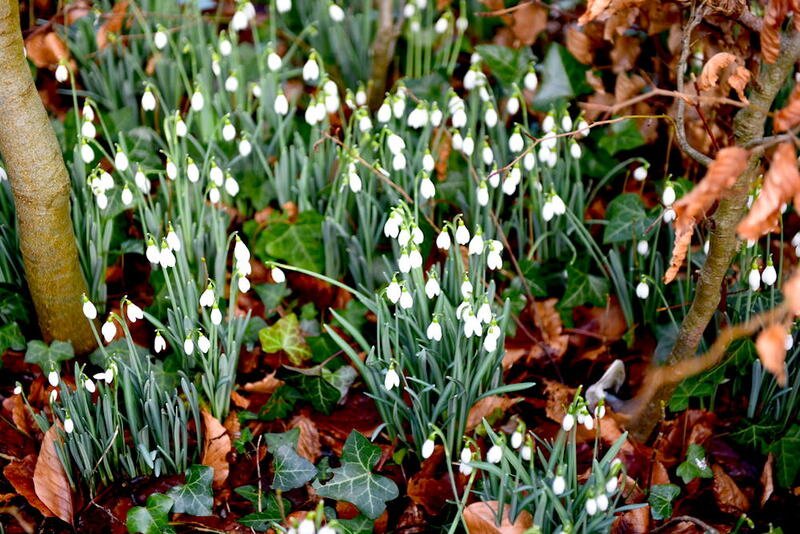 Snowdrops in bloom in my garden. Wider range of flowers out and about. Last week at a rehearsal in a school hall, an amazing display of spring flowers just outside. Professional gardener, I presume. I went to Pembury House Garden, Clayton, http://www.pemburyhouse.co.uk/ on Saturday, where the snowdrops and hellebores were in fine fettle. Camelias also flowering, but daffodils yet to open to any extent. Highly recommended if you are within range. One or two places near us have daffodils in full flower, although mine seem to be later varieties. There are signs of imminent flowering, although we have a lot of narcissi which are always later than the daffodils. scotia wrote: Back in our garden, the snowdrops are blooming, and the hellebores are just pushing their buds up. It always seems a pity that you need to get down on your hands and knees to see the full beauty of their flowers. Maybe I should try them in a hanging basket. The wife is a complete hellebore nut, and our garden is the living proof that there are quite a lot of new cultivated hellebore varieties that hold their heads up proudly. Pink ones, white ones, big ones, small ones, some as big as your head. (Mild exaggeration, possibly.) All going like the clappers at the moment, and they'll carry on showing until at least early May, because their petals are in fact bracts and not petals at all. One of the true delights of the spring garden. there are quite a lot of new cultivated hellebore varieties that hold their heads up proudly. Yes - we have very recently discovered these new varieties - so our collection is now being updated. Yes - we planted one of the new varieties last year, and it is putting on an excellent show. Our more traditional (drooping head) hellebores are just starting to open their flowers. And the first of our snowdrops are blooming (Central Scotland). It seems like an early start to the season.